"Hey, how long has the radio been off?" 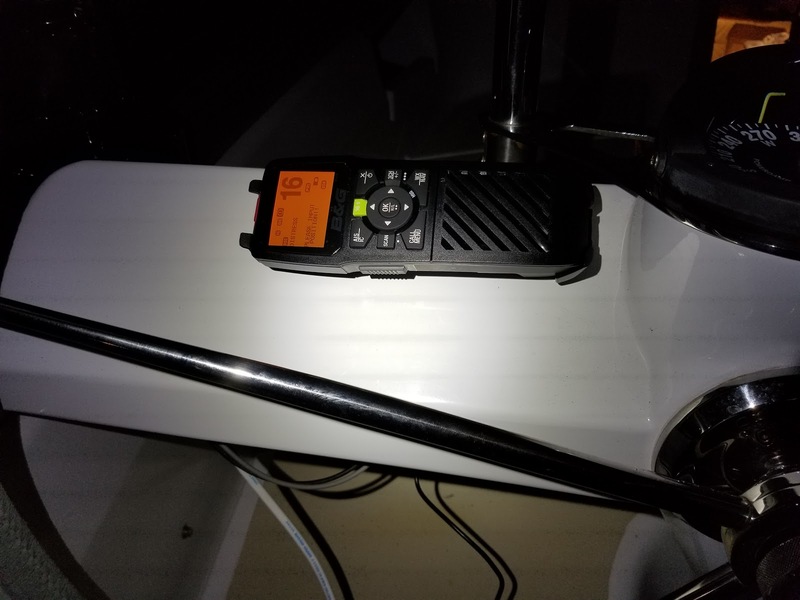 This was asked more often that we would like aboard Argon when one of us would discover that our VHF Radio had decided to spontaneously turn off at someone unknown time during a passage. The "fix" was to just reboot it and hope it stayed on this time. It usually did. Argon's instrumentation is almost entirely Raymarine equipment. 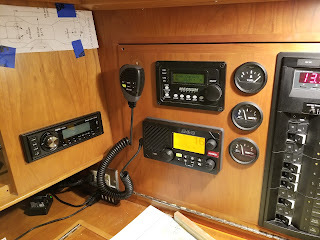 Most of it is pretty good, but when it comes to radios, Raymarine has a particularly dismal reputation. Just ask the internet. Tartan equipped Argon with Raymarine's lowest end (at the time) radio - the now discontinued Ray55. The first issue we had with it was that the remote handset in the cockpit failed. We replaced it ($140) last year. This year, not only did the handset start to get flaky again but the radio started doing this annoying turning-off behavior. Radios are really important. It's time for a real radio. iCom and Standard Horizon are generally thought of as the best brands of VHF Radios. We looked at both and the remote handsets that were available for them. 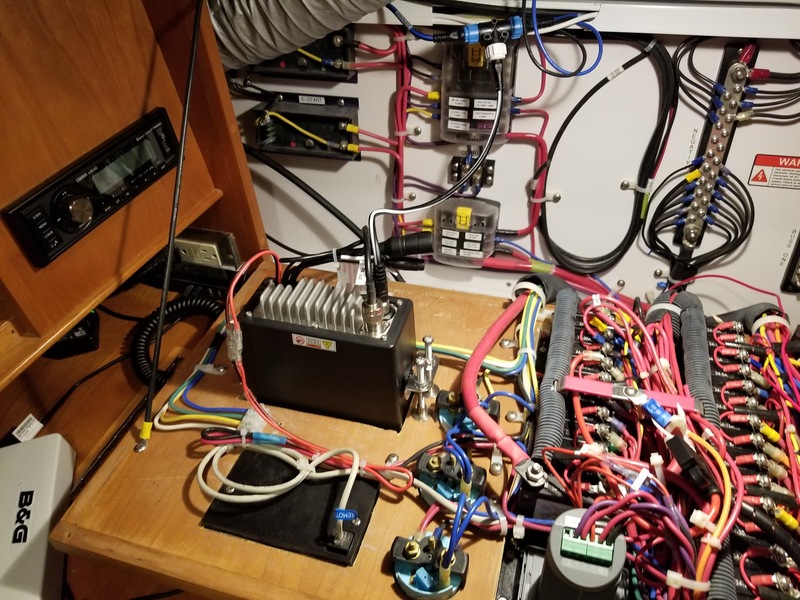 The biggest pain was going to be to replace that remote handset wiring out to the cockpit. Not only that, but they seemed to have an equally cheesy connector for the remote set and I couldn't help wonder how long it would be before I'd be replacing those handsets too. I wondered why no one made a wireless remote handset. Well, they do. 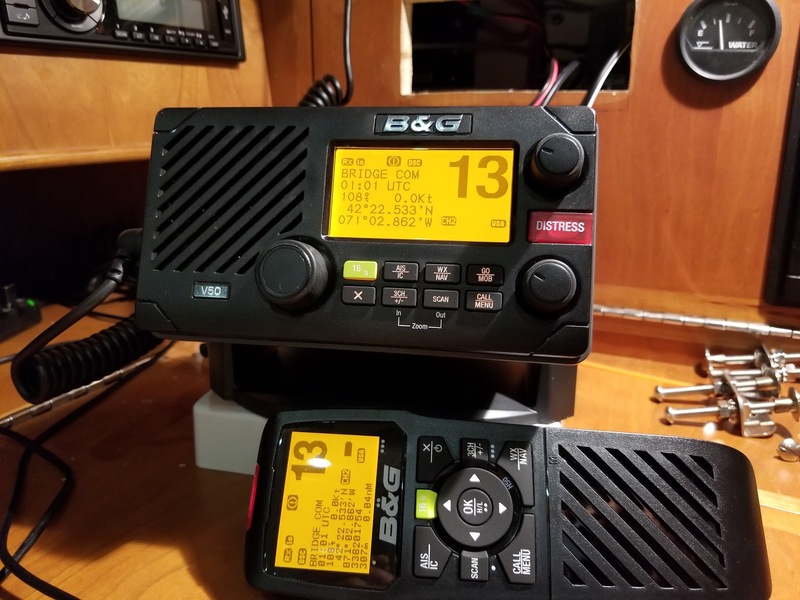 B&G and Simrad (both Navico companies) make a radio and offer a wireless remote handset. They are wireless in the sense that the audio is wireless, but they still sit in a charging cradle which you must get power to. 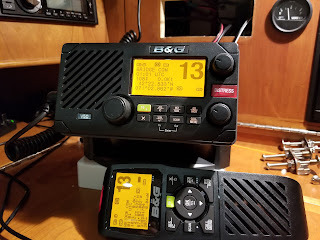 After reading and researching a bit, we decided to go for the B&G V50 radio and H50 wireless remote. We decided to get a second charging cradle and mount one inside at the nav station and the other out in the cockpit. I found a relatively easy way to get power wiring to both. The hardest part of the installation was getting another power wire out to the cockpit. We decided to place the charging cradle on the port side wheel pod and fortunately, it was not too horrible of a job running power there. We used one of the spare breakers for the charging cradles and I've ordered a breaker label "VHF2" for it. The next hardest task was that the rectangular opening in the nav station panel needed to be enlarged for this radio's footprint. There seems to be two common sizes and this one is the taller one. Normally this would have been easy except my dremel saw tool was in the trunk of Linda's car and Linda's car was in a repair shop seventy miles away in Newport. Luckily I was able to borrow a similar tool from a friend at a nearby marina. Argon's network is a modern "Seatalk ng" one with all devices happily plugging and playing together. The exception to this was the Ray55 radio. It only supported a legacy NMEA0183 interface. 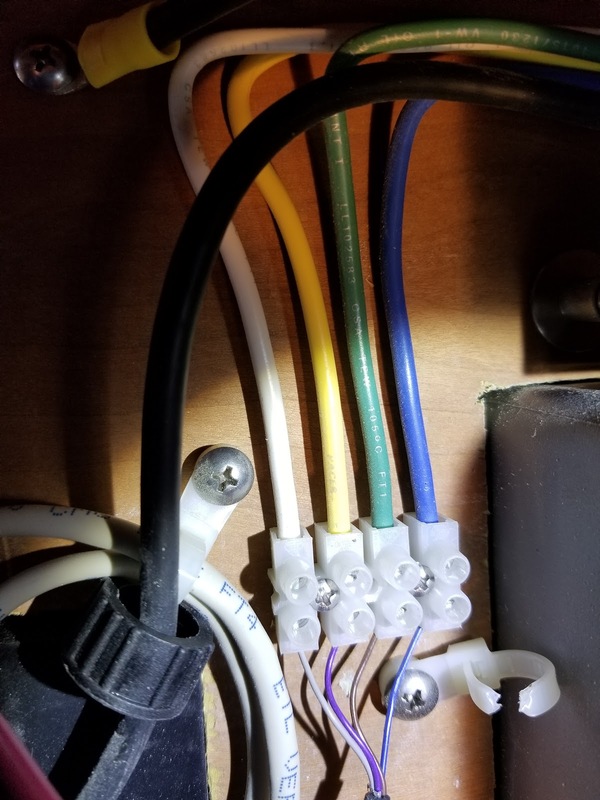 This is connected to the Seatalk net via some sort of 0183/Seatalk interface. The location of this interface is unknown to me. I can see where the wires start but I have no idea where the thing itself is. If I ever find it, I'll rip it out. 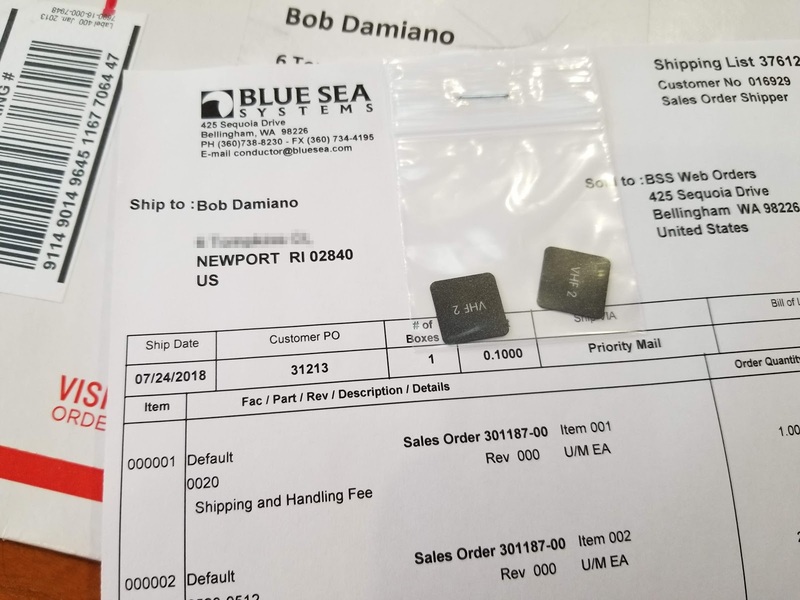 The new radio (and any decent new radio) has NMEA2000 (N2K) network compatibility. N2K is fully compatible with Raymarine's Seatalk with only an adapter cable needed to plug in. The old radio's NMEA0183 connections. Think those signal wires are heavy enough gauge? 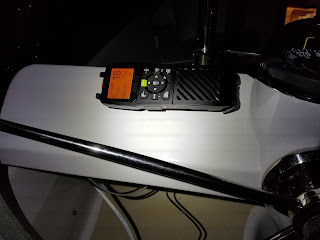 Most reviews of the B&G and Simrad radios said that the wireless remote sound quality was not quite as good as a wired set. I'd have to agree with that. It will remain to be seen if this turns out to be a practical problem. One reviewer said he had terrible interference when the engine was running on his boat. I asked around and this seemed to not be a common problem. It's not a problem on Argon anyway. Ergonomically, the wireless handset is awesome. It's really solid and heavy feeling. With dual helms on Argon it will be nice to not be on a short leash to one wheel while on the radio. Without having to disconnect a wire (with a really cheesy connector), we will always bring the handset inside for storage when not in use. It will set in another charging cradle at the nav station. These radios actually support multiple wireless handsets. This can be handy on very large multi-deck boats I guess. Interestingly, you "pair" each handset with the radio similar to setting up a bluetooth pairing. The pairing procedure worked perfectly as soon as I found the article in the manual. Most modern VHF radios have built-in AIS receivers. Argon already had a full duplex AIS transceiver (we could see and be seen). I wondered how our systems would behave with two competing sources of AIS data on the network and I asked that question on a few sailing forums. Eveyone who answered essentially said "No Problem". Well, everyone was wrong. While the targets still do show up with both AIS data sources running, they are not quite right. 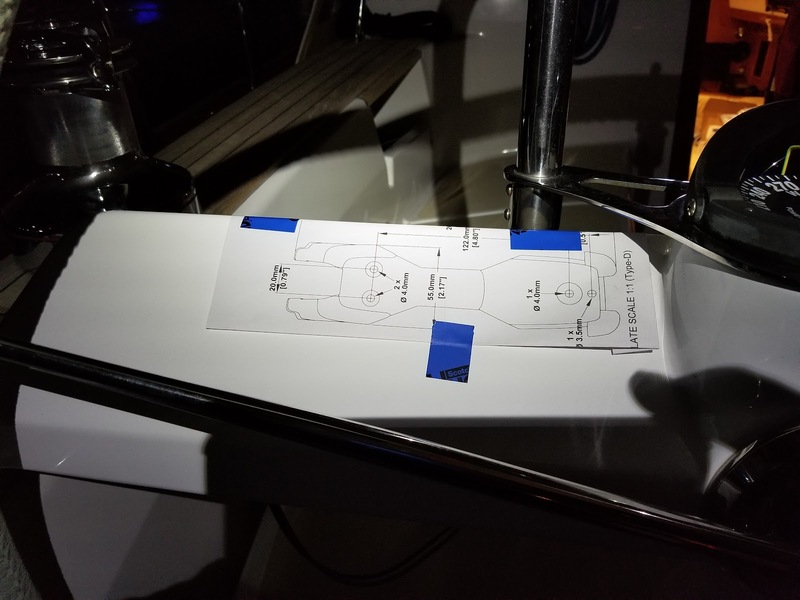 Our chartplotter displays BIG BOATS as bigger targets and will differentiate sailboats by drawing them differently from power boats. With AIS enabled on the B&G, these display details were lost. 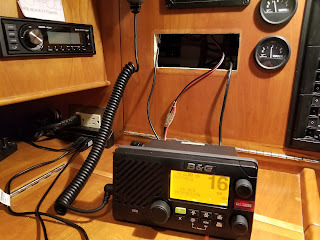 As soon as I turned off the AIS function of the B&G radio, these issues resolved. So the good news is that we do have a redundant AIS receiver in case our main system should have a fault. But the radio must be normally kept in non-AIS mode for it not to interfere with the real AIS data from our tranceiver. Normally, we hate throwing things away. 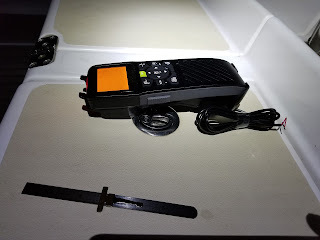 In this case however, I really don't want to give this radio to anyone to use on a boat. Having a radio that just stops working without you noticing can be a pretty unsafe thing aboard. Maybe I'll put it in my museum at home.